While I like to think I live purely for that moment when I clamber over a big old log in the low mountains to discover a stand of yellow chanterelle mushrooms brightening the duff on the far side, I’ve got to tell you I didn’t harvest these particular chanterelles. My friend Chuck put me onto this haul, available somewhat closer to home at Lenny’s, the Ukrainian produce stand up in Greenwood. Very fresh and flavorful these chanterelles were, at about a third of the cost of chanterelles in my local supermarket. I just couldn’t say no. So what do you do with chanterelles? They’re really good with eggs, either in a scramble or as part of an omelette. They’re nice with shallots, which you can sauté with chanterelle pieces and then work into a cream sauce for a scrumptious topping for baked potatoes. They can also give any pasta dish – be it tossed noodles or lasagna – a whole new earthy dimension. But the perfect pairing for chanterelles is winter squash. Hubbard, butternut and sweet pumpkin – they all complement the taste and texture of these wild mushrooms. One of our favorites has become acorn squash, because it tastes good yet isn’t too ‘squashy’. It’s readily available, easy to cook, and just the right size for a few entrees. Here’s one way to put the two together. Make the pasta dough: Mix semolina, flour and salt in a 2-quart mixing bowl and make a well in the center. Beat the egg with a fork in this well, gathering flour into it, and then mix in the water. Constantly stir, drawing in flour and semolina from the sides until the dough thickens. Knead for a few minutes with your fingers, so that all of the dry mix is incorporated. Put the dough onto a counter sprinkled with semolina, cover with the inverted bowl and let sit for 30 minutes. Bake the acorn squash: Split an acorn squash with a strong thin knife from stem to flower end down the flesh of both sides and then, with the knife still stuck in at one end, smack hard on a cutting board to break the squash in half. Scoop out the seeds and membrane with a spoon. Make two circles of oil on a small cookie sheet smaller than the diameter of the cut end of the squash halves, and sprinkle the oil with black pepper. Put the squash halves face down onto the oil, and prick the skin a few times with a sharp knife. Bake for 40 minutes in a 400° oven and let cool. Woodfired note: If you’re looking for a woodfired aspect to this recipe, you could bake the squash in your woodfired oven. Woodfired squash is lovely. After baking bread or pizza in your oven, bake the squash until fork tender. It will keep in the fridge for several days. Roll out the pasta: Secure your pasta machine to a work surface. Divide the pasta dough in two and form each half into a cucumber shape. Flatten each piece with your palm on a table sprinkled with semolina. Send dough through the rollers of the pasta machine on ‘1’. (These numbers refer to roller settings on my Atlas machine. Yours may vary. )Fold in half and send through again and then, turning the long edges over toward the middle, send through a third time. Repeat until your pasta is smooth and supple. Let rest 5-10 minutes, uncovered. After a rest, send the pieces of pasta through the rollers on ‘3’. Crosscut each piece into one 5% longer and one 5% shorter piece. Send all pieces through on ‘5’, and let rest for 5-10 minutes; cover lightly with plastic if your pasta begins to dry out. 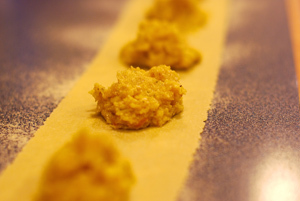 Build the ravioli: Work with one long and one short piece of pasta dough at a time. Roll one of the shorter pieces out on ‘6’ and put on a counter that has been sprinkled in a ribbon with semolina. Put a rounded soup spoon of filling every 5” along the pasta, until you’ve made 10 mounds, equally spaced. Dab milk in circles around every mound. Put one of the long pieces of pasta through the pasta machine on ‘6’ and then, holding it above the lower piece, drape this piece over the mounds of filling, tucking it in around the mounds. Use your fingers to press the cover in place above the mounds, squeezing as much air as possible from the center of the ravioli. 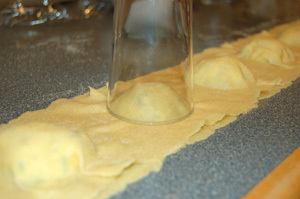 Shape and seal the ravioli using the rim of a drinking glass to press around the filling. 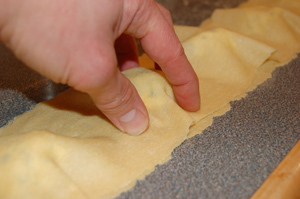 Cut the ravioli apart with a roller and, if desired, use kitchen scissors to make a ¾” brim around the filling. Place the finished ravioli on a plate sprinkled with some semolina while you make the other ravioli. Sauté the mushrooms: Brush the chanterelles clean of any dirt or needles, and cut off any pieces at the stem base or the edge of the gills that are discolored. Quickly rinse and shake them right before you’re ready to cook them if the tops are dirty, but never soak them in water or they’ll get mushy. Have a sauté pan or large frying pan ready over medium heat with the butter in it as you finish cleaning the mushrooms. Holding the broad horn of the trumpet towards you, break pieces from the edge with your thumb so that ribbons of chanterelle peel off. Lightly salt and pepper these mushroom strips and sauté them for 8-10 minutes until they darken in color and exude some of their juices. Remove the mushrooms to a warm plate but leave the juice in the pan. Finish the dish: Boil 4 quarts of water in a large pot. Slip 10 ravioli at a time into the boiling water and, once the water has regained a rolling boil, cook for 3 minutes. Remove to warm plates, drizzle with a bit of olive oil, and keep warm in a low oven while you cook the rest of the ravioli. Reheat the mushroom pan and cook off all but 2 or 3 tablespoons of juice. Toss the mushrooms back into the pan for a few minutes until they begin to sizzle. Divide the hot mushrooms among the plates, top with any pan juices, and serve steaming hot. Yum! Mushroom Note: If you’re into hunting mushrooms in the wild, that’s great! Wild mushrooms can provide a real bounty for the table. If you’re just getting started, my best advice is to get a good field guide and take a course or – better yet – go into the woods with someone who has experience. And be careful. Even with chanterelles, which are pretty distinct once you know them, there are a few poisonous look-alikes. For more information, contact your local mycological association. Happy hunting! 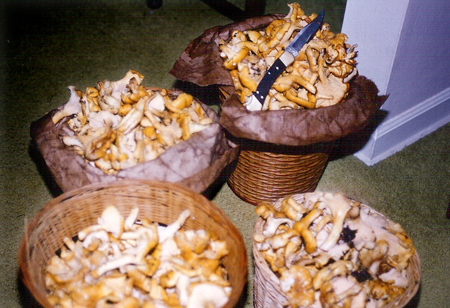 One memorable haul of chanterelles from a mushroom hunt in the 90's. I love mushrooms, this ravioli looks delicious. I also love that you used a milk glass to cut out the ravioli! Who needs a ravioli cutter? that’s a unitasker! oooh… this looks good. i love ravioli, specially with mushrooms. I could really sink my teeth into your ravs! The filling sounds amazing and look at all those chanterelles! That’s amazing! I can only imagine, but I bet there’s nothing like fresh, homemade raviolis…and then the pleasure of knowing you’ve just hunted and used your new gather of mushrooms. I would luv to try this. My husband is a huge mushroom fan and I love ravioli…this recipe would please us both! Homemade pasta is truly wonderful. I am sure these flavors with the chanterelles make the dish particularly good. 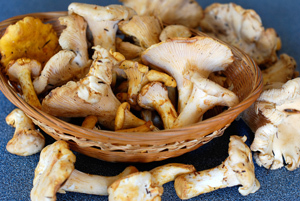 Wonderful, love fresh chantrelles, and this recipe is great! YUM! Do you hire out for parties? 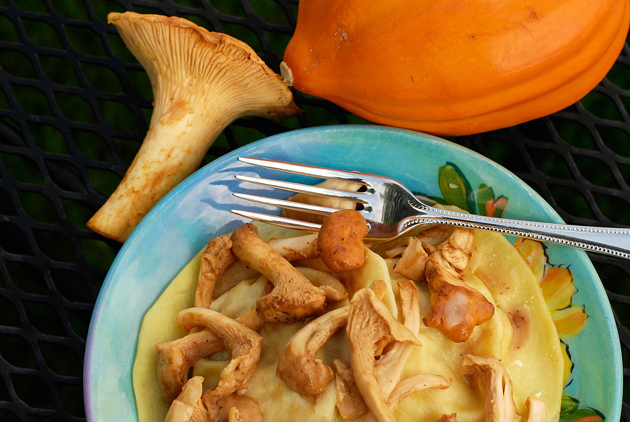 Wow, this is a wonderful chanterelle ravioli recipe. Great concept…cutting the dough with the edge of a glass! Tried, and true! Thank you, for sharing. Will buzz your recipe, and share it! This is such a beautiful, rustic, hearty meal! I wish chanterelles grew here! This looks fantastic. Great fall flavors! This sounds amazing! My husband and I love wild mushrooms and all of the flavors of fall! Great post! Hey Don! This dish sounds great! I need to go to Lenny’s where is it? I’m moving back to Seattle and would love to see the oven too! After a good hunt we always have a chanterelle feast where people bring their favorite chanterelle dish. One of my personal favorites is barbecued pizza with chanterelles and bacon… I think I’m drooling right now! Absolutely wonderful!! Thanks for sharing! At first glance I thought that ravioli was plate-sized, which would have been awesome, but they still look amazing. I need to get a pasta attachment! Mmm, sounds great! I van’t get enough ravioli ! We made this tonight. No ricotta, 00 semolina, and a white wine cream sauce with garlic and some of the filling and mushroom liquor. Truly a testament to picking and cooking all on one day. If you’re fantasizing about what such a day is like, yes it’s that good! Nice pages Don. Safer yet – join the Puget Sound Mycological Association – a great group who will keep you straight while you learn.